I really love hot cocoa in the wintertime. It’s a nice comfort drink for me. I don’t usually purchase the packets at the store. One because my family can’t have the dairy that’s in them and two they can be a little expensive for what you are getting. I usually mix up a cup of cocoa when the mood strikes. But I thought it might be nice to have a cocoa mix the whole family could use. One that is dairy free or can be made dairy free. That’s how I came up with this easy to make recipe. This recipe only takes a few ingredients that you probably already have in your cupboard. 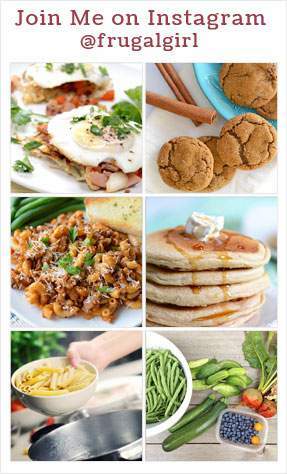 I had all of them in my cupboard when I decided to make this mix. I hoping it’s the same at your house too. For the cocoa in the mix, I use the bulk cocoa from Winco Foods. 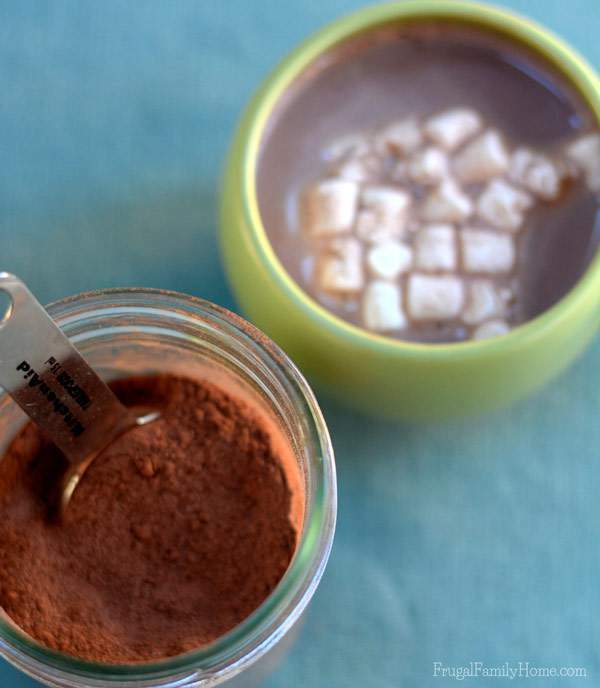 If you prefer a certain type of cocoa, use the one you like the best. I used regular sugar but you could use, organic sugar if you prefer. I added cornstarch to the mix, but if you prefer you can add arrowroot instead. 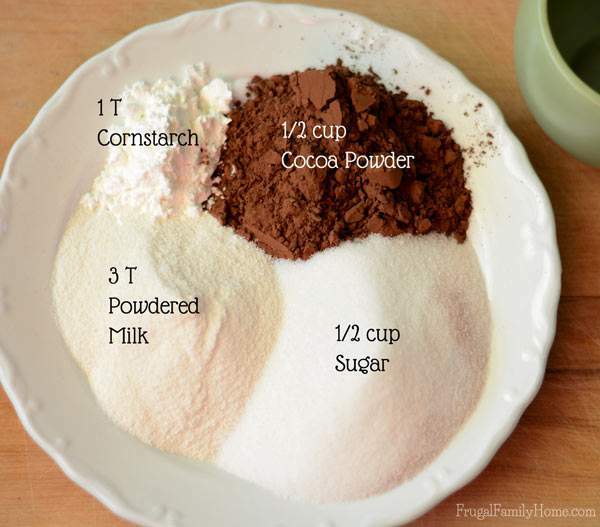 If you don’t have powdered milk, you can leave it out of the mix, but I do think it makes the cocoa a little more creamy. Once you have all the ingredients measured out, it just takes a few minutes and a whisk to combine them. Store the mix in a sealed container. I used a canning jar with a lid to store mine. This mix can be stored in the cupboard. Heat 1 to 1 1/2 cups of milk in a mug. I heat mine in the microwave, but it could easily be done on the stove top too. 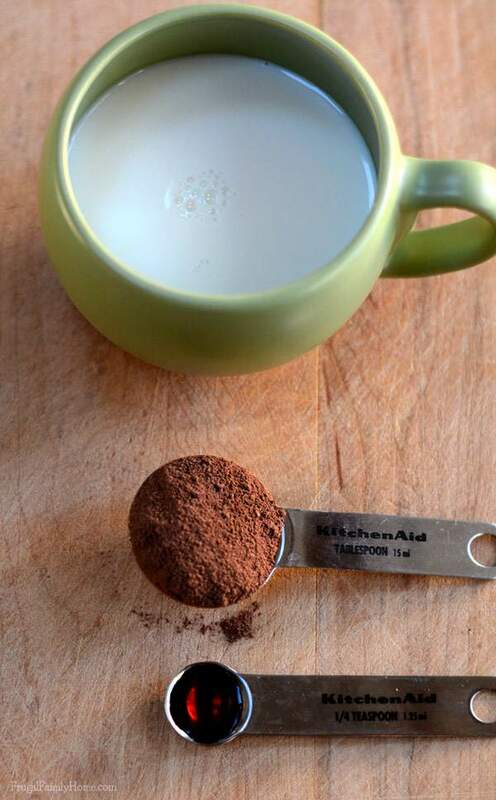 Once the milk is nice and warm, add 1 tablespoon of the cocoa mix and stir well. I also add 1/4 teaspoon vanilla to my cocoa, but it’s optional. 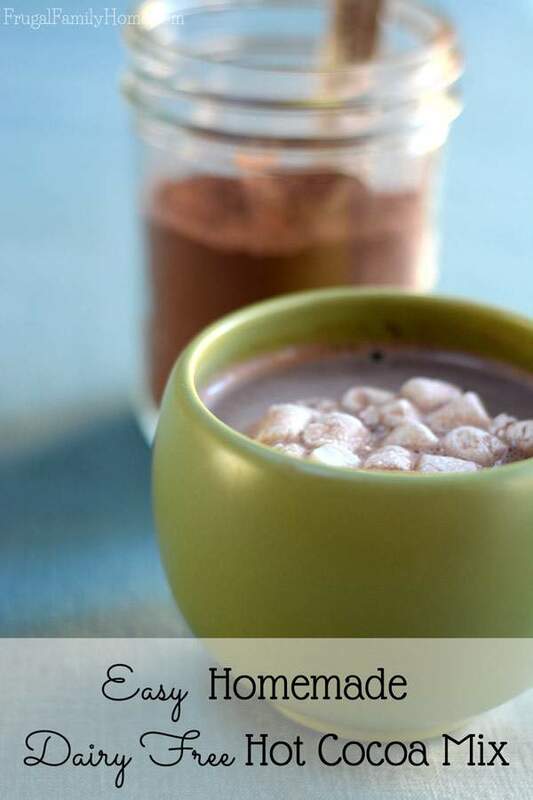 Finally, top the cocoa with a few mini marshmallows or some yummy whipped cream and enjoy. This is such a great warm drink on a cold winter’s day. If you like coffee, this mix would also be great in a mug with a half a cup of coffee and half a cup of milk, instead of all milk. Kinda like a homemade mocha. You could also use this mix for a nice iced hot chocolate in the summer time too. 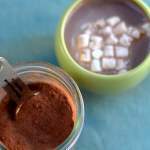 Make your own homemade cocoa mix to suit your needs. 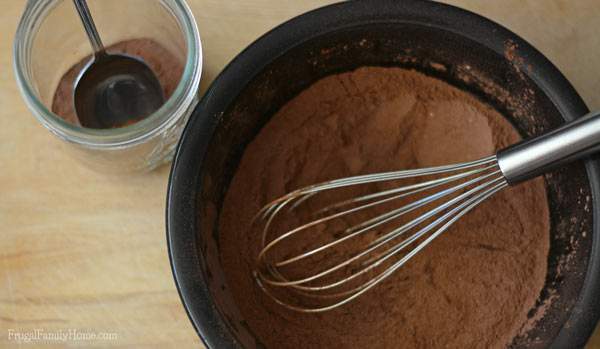 This is an easy to make cocoa mix that can be made dairy free. Place all the ingredients in a bowl and mix well with a whisk. Heat a 1 cup to 1 1/2 cups of milk in the microwave. 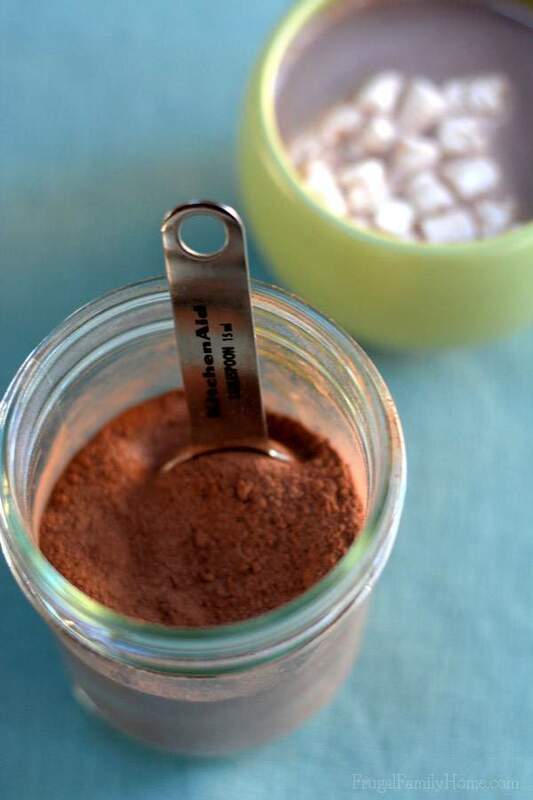 Stir in 1 tablespoon of hot cocoa mix. Add in 1/4 teaspoon of vanilla, if desired. If you don't have powdered milk on hand you can leave it out of the mix. But I think it does make the mix more creamy. For the dairy free option, I use Better Than Milk Powder Milk Alternative or Vance's DariFree for the powdered milk. What a favorite cold weather drink you enjoy? I’ve made quite a bit of hot cocoa this winter for my kids. 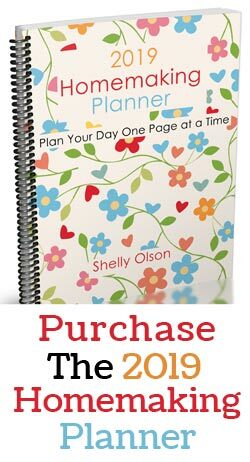 🙂 I’m definitely pinning your recipe, Shelly! Thanks for pinning the recipe, Erin! We just ran out of our powdered mix, and I put it on the grocery list to buy more at Winco. Thank you, I have all those ingredients on hand. I’m going to mix this up right away!